Help needed to fix this guide, like: better English names, fill up the mixing infos, more videos/pictures, etc. All help appreciated, thanks. If you have coctail of 3 kind of wine, you can awake Yaksa Hazard. He is interesting, because he drops parts of unique armor set besides usual 30lvl boss loot. Where you can find special wine? You must bring wine of wind, transparent wine, one more wine(don't remember the name) into a village of seven bridges. More bosses being listen in the upcoming posts. Great guide, as far as i can see everything´s fine. Morpheus was never beaten in all the CBTs. "After resigning NCsoft I just chilled at home and my wife did not like it. Also, great article Llexx. Found out about a few bosses I have seen yet. Did some research, i thought all the time, that the swords combined in "Sweet Sorrow" are dropped by Pirate Captain Langley. 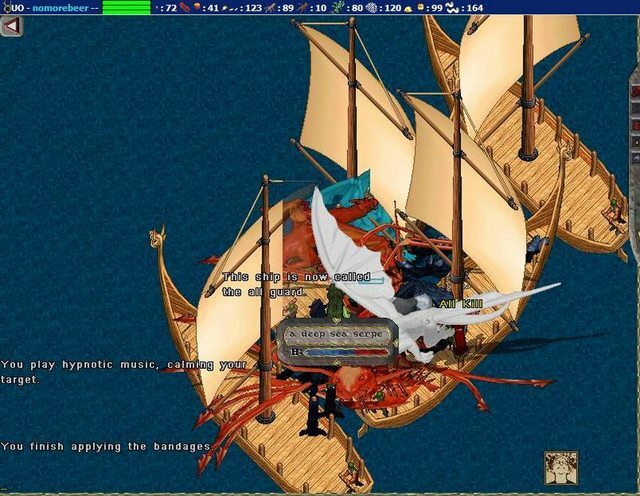 I still want to relive this kind of moments killing krakens. What i need you guys is to find better names for the bosses, since we don't have any official English name for them yet, and like this most of them sounds ridiculous. You have the official Korean name of the bosses, try to translate it and used your creativity, also have to explain how i wrote the bosses name, first part of the name is from the Russians (translated from Russian), the second part of the name is Korean, this is the one inside the () brackets (translated by google), third part of the name is just a description. Well too bad that all the bosses have been killed during the betas, hope they add some real badass bosses which will be unkilled even after 6 months of server start, to give some challenge. Instances were in the plan since the beginning, but got removed for CB4, and readded for CBT5. Rumors say there gonna be 4 of them (level 20, 30, 40, 50), but their function are not like in themeparks, the best items won't be dropping in them. The level 20 instance is for 3 people, the level 30 one is for 4 people, don't have info for the higher. They function more like a fill-up for PvE'ers (hope so). The instances give crappy XP and loot. As long as it stays that way, i'm fine with it. People will do them perhaps once for the story line, and not just close themselves in, never to be seen again. Remember the "corrupt GM" thread? One, there was a raid boss NPC named Morpheus. Using a specific item named "Shahozen's Hammer", this NPC could be stunned indefinitely more or less. GM was alerted to this and removed all the items gained through this way. But another GM's stance was that it wasn't a bug. That was the kill by combo and his mates. The one and only kill of him. That´s why there is no video material of it. So in my view Morpheus remains unbeaten! just close themselves in, never to be seen again. I'm disappointed for hearing about instances too,but as long it wont drain the players and their efforts from open world i can tolerate it. if,as amaterasu says,the instances aren't rewarding might be not that bad,expecialy if they have a descent cool down time for at least 24h. Then ask the fifes and drums to play. With colours blazing like the sun. Along the road to come-what may. One more guide translated in French. Traduction Française du guide des bosses, Partie 1/3. Lieu: Océan, "The Degrees of Freedom"
Traduction Française du guide des bosses, Partie 2/3. Lieu: Continent Occidental, "Gweonid Forest"
Lieu: Continent Occidental, "White Forest"
Lieu: Continent Occidental, "Garangdol Plains" (Gracel Plains) et "Cross Plains"
Lieu: Continent Occidental, "Falcony Plateau"
Lieu: Continent Occidental, "Rainbow fields"
Si vous avez un cocktails de 3 sortes de vins, vous pouvez réveiller Yaksa Hazurad. Il est intéressant, car il drop des parts d'armure unique (set) en plus des loots lv 30 de boss. Quels sont les vins spéciaux ? Vous devez trouvez les vins suivants : vin du vent, vin transparent, et un troisième (pas d'info dsl :/) au village des 7 ponts (seven bridges village). Le vin spécial sera prêt lorsque vous aurez récupéré et utilisé les 3 types de vins. 1) Sur le boss de "Snake Field" dans les "Lands of Songs"
2) Sur le boss de la "Cave of Wings", près du "Snake Field"
La même, avec des machines de siège. Lieu: Continent Orientale, "Ancient Forest"
Lieu: Continent Occidental, "Solzreed Peninsula"
Lieu: Continent Oriental, "Falcony Plateau"
Lieu: Continent Oriental, "Rainbow Fields"
Lieu: Continent Oriental, "Tiger Spine Mountains"
Lieu: Continent Oriental, "Ancient Forest"
Traduction Française du guide des bosses, Partie 3/3. Lieu: Continent Occidental, "Two Crown"
Lieu: Open Sea, "Growling Island"
Antalrone - Boss dans "Hells Swamp"
Boss qui apparait avec les évenements dynamique sur le continent du nord. YinZetsu, maybe you should make a thread at the guides section and put all this in there, would be easier for any french people to find them that way. Nice work, though. In a few this whole topic will get old anyways... But i support Eligors idea, i would demand from Admin to make language section in the "New Articles & Guides".